The Wii U simply wouldnt be a Nintendo console if there wasnt a Mario Brother or two to help sell it. Over the years, Super Mario launch games have been used specifically to highlight the key selling points of a new home console, and this follow-up to New Super Mario Bros is no exception. 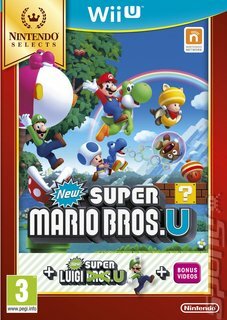 Just like its predecessors, the game is a 2D multiplayer platformer - up to four players can grab a Wii Remote and assume the role of Mario, Luigi and two Toad characters at the same time for simultaneous co-op (or competitive) play. Some new features in this game include an array of precarious level gimmicks - a snow stage played host to some large spinning stars, which required careful timing in order to overcome - and a brand new flying squirrel suit. If you get this, your character will acquire a funny looking cape (which will make them look like a vampire on foot) that can make you soar with a simple spin jump. Like similar air-based power-ups, you can use the flying squirrel suit to glide as well. You can also pick up Baby Yoshis throughout the level and carry them around with you. The benefit of doing this? You can make it expand like a massive balloon and float upwards, with spin jumps helping you to stay in the air for longer. Baby Yoshis will also gobble up any enemy that walks into your path, which is quite handy as the stages in New Super Mario Bros. U can get pretty tough to say the least. As well as the four-player action you'd expect, a fifth player can wield the mighty tablet and see everything thats happening on the TV screen. But, you can also interact with your fellow platformers indirectly, by using the touchscreen to place blocks within the level. The general aim is to help your friends by helping them get across bottomless pits or obtain that out-of-reach Star Coin - hence why its called Assist Mode. But, it could just as easily be called Adick Mode, as the GamePad user has the power to hinder as well as help the other players. Sticking blocks in front of running characters, establishing an artificial roof to stop one from hitting that coin block, setting up for a pit drop... the possibilities are endless. The best thing about the GamePad though, is that if youre just playing on your own, you can begin a game on the tablet and continue playing it on the controller while other people use the TV. In a nustshell, it's old-school Mario action with a twist that's only possible on the Wii U! Yes, you love Mario. He's the greatest action hero plumber the world has ever (and no doubt WILL ever) know. Of course you do. Who doesn't? But poor old Luigi - he doesn't get half as much time in the spotlight. 2013, however, has been declared by Nintendo to be the year of Luigi and, as such, the taller of the Super Mario Bros gets his own platforming adventure. Of course, multiplayer makes a return. Other gamers can join in, playing Yellow Toad, Blue Toad or Nabbit - a character who first popped up in New Super Mario Bros. U and is playable here for the first time. In fact, Nabbit brings some skills of his own into play. He's invincible, and any objects he picks up are converted into 1-ups at the end of the level - perfect for beginners! Or, alternatively, a further player can play in Boost Mode to use the Wii U Gamepad to drop handy blocks into the level for Luigi!